Oooey, gooey, crunchy, and sweet, it’s the cookie of your dreams. 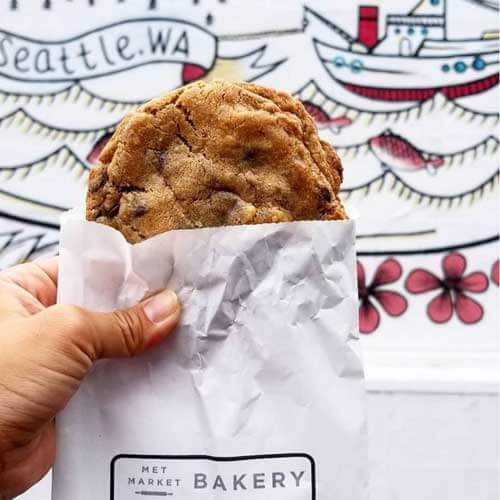 Seattle’s legendary chocolate chip cookie was inspired by our Metropolitan Market founder, and perfected by our own Bakery Specialist. Baked fresh all-day long to guarantee the perfect balance of crispy exterior and melt-in-your-mouth goodness, they are packed with both semisweet and bittersweet Callebaut Belgian-style chocolate and crunchy, toasted walnuts. Try our Best of Met specialties at upcoming events and tastings. 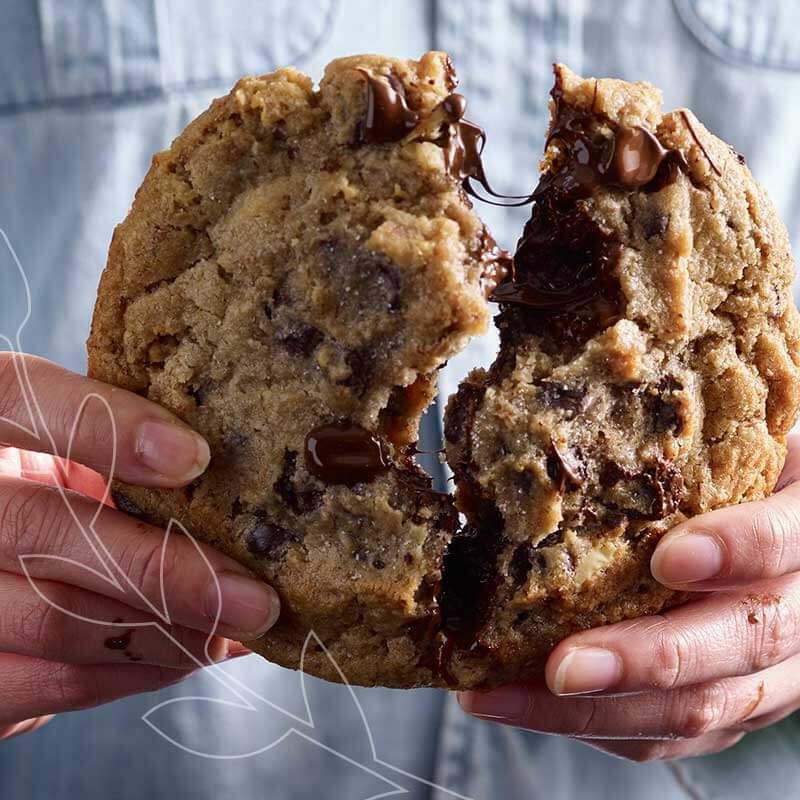 The Cookie’s story begins in New York, when our founder discovered a near-perfect chocolate chip confection. He knew we had to build one of our own, even better than the one he found. Packed with two types of premium Belgian-style chocolate, toasted walnuts, real butter, and finished with a sprinkle of fine French sea salt. About 1,500 cookies are baked each day in our stores. In just under 5 days, that represents enough of The Cookie so that, when stacked, they would stand as tall as the Space Needle. Hungry for more? Get the full story of The Cookie. 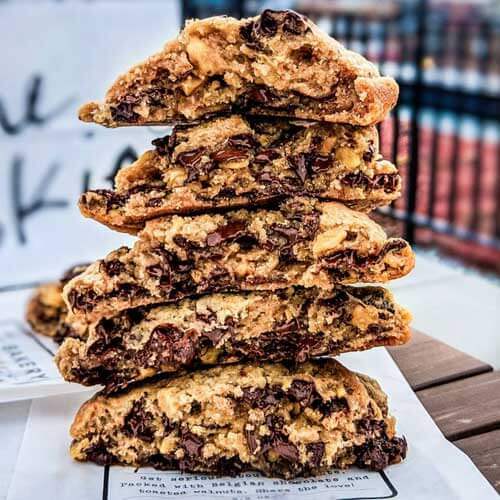 See Seattle’s Best Cookie come together and discover what makes it so special. Seattle loves The Cookie! We’d love to see where and when you like to eat this delectable treat. Use #bestofmet to share your own cookie adventures. Just imagine: Sliding a still-warm cookie out of a bag emblazoned with the phrase “get serious about chocolate”; the generously-sized, perfectly-textured treat revealing a beautiful mosaic of chocolate chips and toasted walnuts when split in half, the act of doing so producing a satisfying crunch and snap. 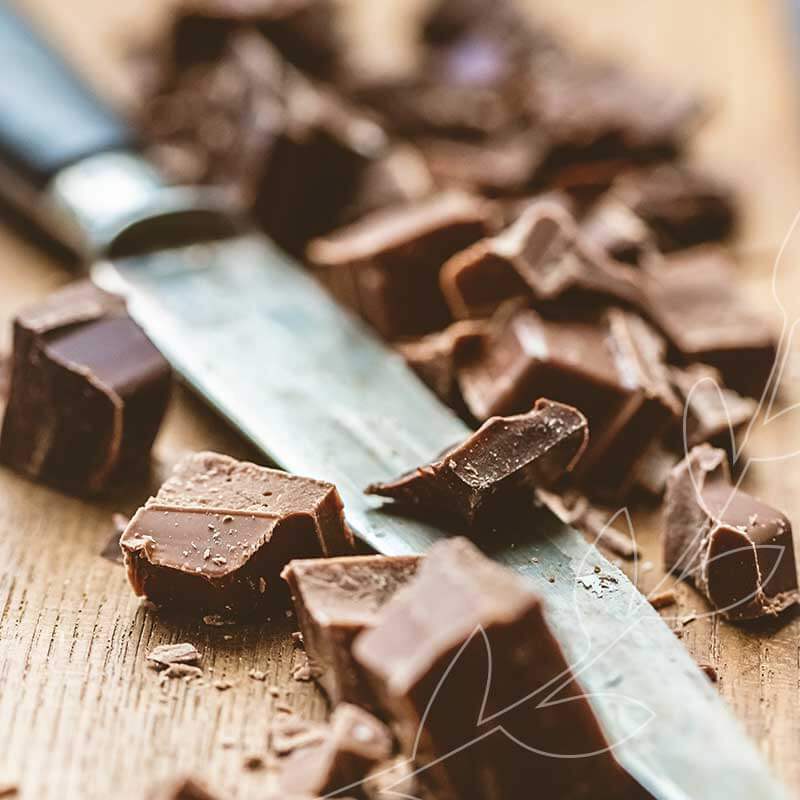 Before you know it, there’s chocolate on your fingers and you’ve made it to the checkout counter with only half of your treasure still intact. Meltingly-smooth with both semisweet and bittersweet chocolate, yet crisp and airy with pockets of real butter, this is Metropolitan Market’s The Cookie. It all started when our founder Terry Halverson walked down a particular Manhattan street one day about five years ago. 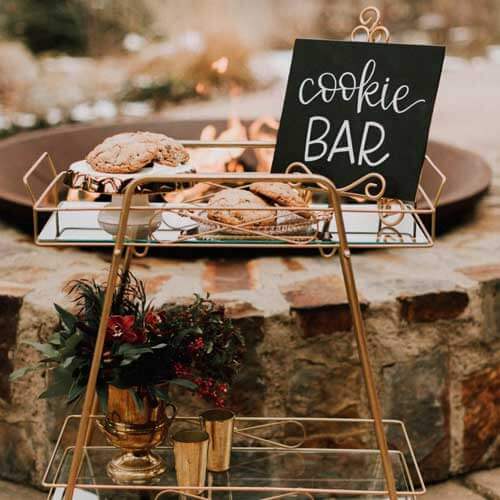 The chocolate- and butter-rich aroma of cookies fresh from the oven wafted into the street, past a line of customers progressing toward its source. 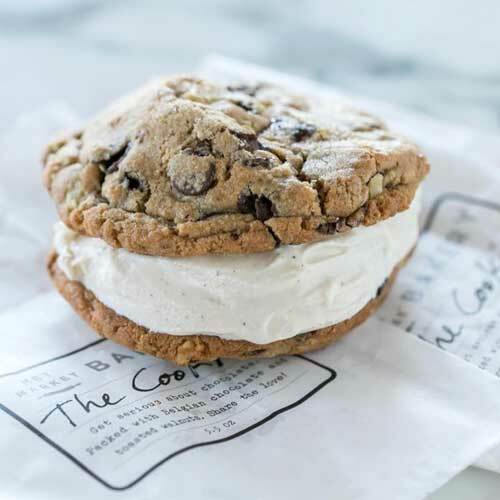 After tasting that cookie, Halverson decided that Metropolitan Market would sell a cookie of its own, one as good—no, even better—than the one he had that day. 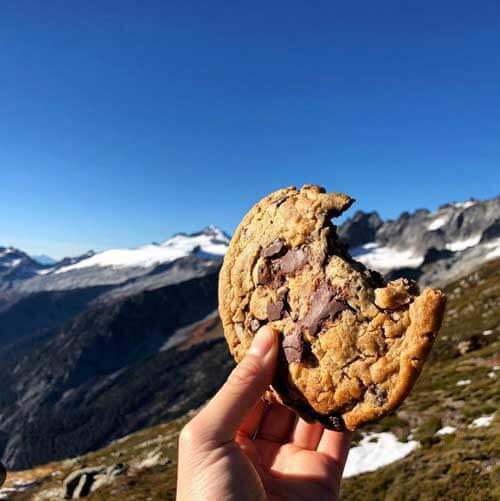 Inspiration may have come quickly, but perfecting The Cookie was not to be rushed: Bakery Specialist Tristan Ambrose stepped up to the challenge of developing the recipe, and after countless test batches, she found the secret—more chocolate. 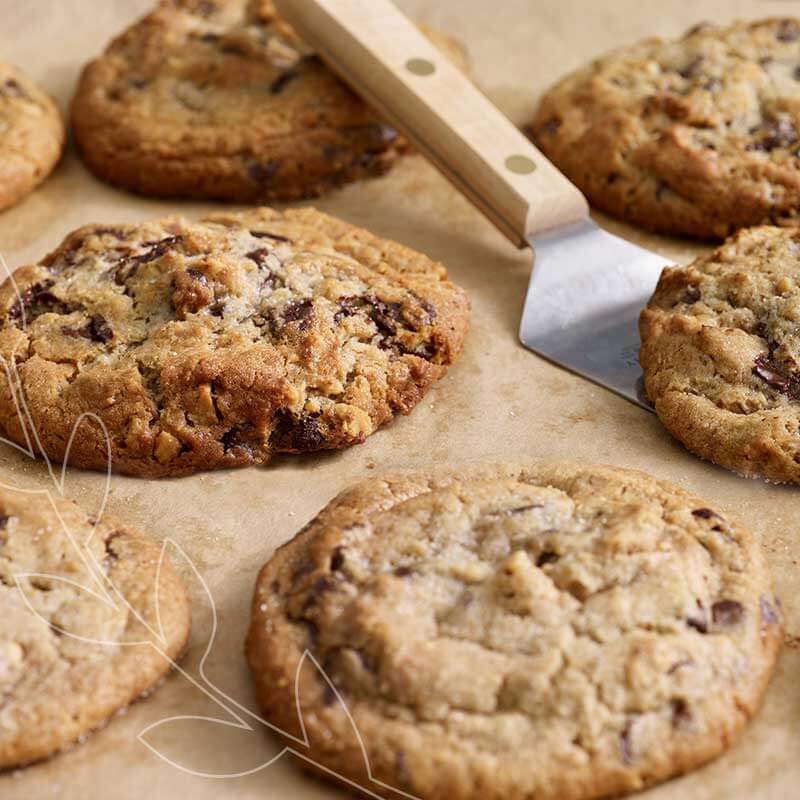 Nearly half of the total cookie weight is in chocolate, as the final recipe boasts not just one, but two different types of Callebaut Belgian-style chocolate in the mix. Toasted walnuts add complementary flavor and texture, as does the sprinkle of fine French sea salt that’s flourished on top before baking. 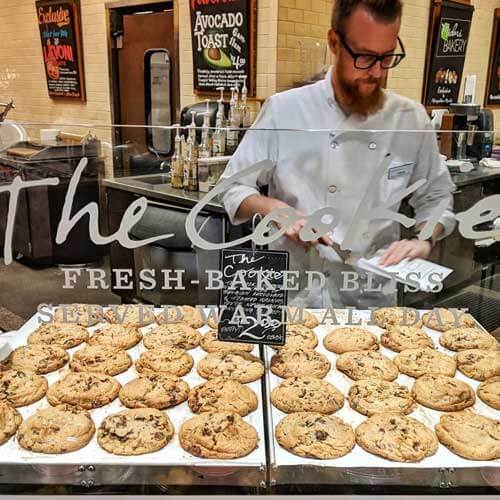 Having achieved near-legendary status in a matter of years, The Cookie is baked in all our stores continually throughout the day—and it’s warm and waiting for you right now.